Cousins is a layout I created for Bella Blvd. I used Elmer's paint pens to create this one. I created "Rain" for Pebbles. I love the boldness of this project. "Celebrate Coming Home" is a mini album I created with the WRMK Fuse Tool . You'll want to see the inside of this one, I promise! "PreSchool Besties" tells the story of one of my most embarrassing moments. "The life of Goldie" is a heritage layout I did. I taught a couple of classes last year on heritage scrapbooking. I hope to teach many more. I love this topic! I created "Christmas Tree Hide & Seek" for Bella Blvd. I *heart* Bella Blvd! "He Loves" is another Bella Blvd project. I document my kids current favorites every year or so. It think it's a great way to show their personalities and how they change from year to year. A few months ago I was featured on the Scrapbook Expo blog. This is the layout I created for that feature. Before you go, I think you'll want to know that I have not one, not two, but THREE prizes to give away in addition to your entry into the grand prize drawing of $80.00 gift certificate for making your way through the entire hop. 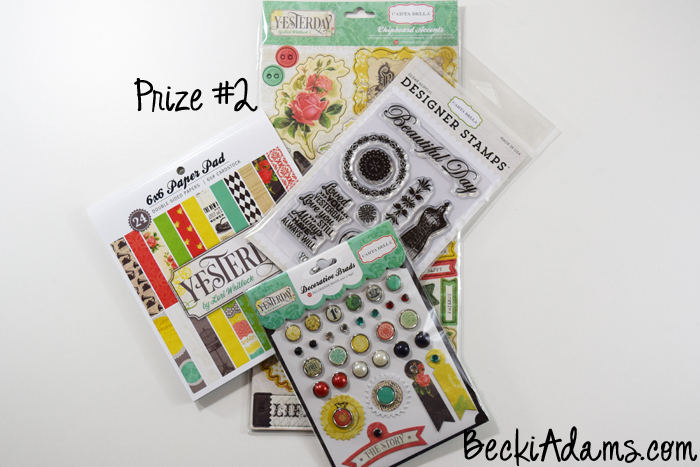 The first prize is a few embellishments/stamps from the Pebbles Harvest collection. The second prize is a few embellishments and a 6x6 paper pad from the Yesterday collection from Carta Bella paper. The third prize is a few chipboard alphabets from Bella Blvd. All you have to do to have your name entered into a drawing for ALL of these prizes is to leave your comment here telling me which of my 12 favorite layouts is your favorite layout. You have until January3rd at 10:59 MST to get your entry in. Have fun and good luck!! Now, I'll send you off to Wendy Antenucci's blog. Shes got some amazing projects to share with you. Gorgeous layouts! Love them all! All lovely! Rain is my favorite because of the color combo. wonderful pages - so difficult to choose just one - perhaps "HAIR"
I just love all of your top ten, I mean twelve...fabulous!!! Beautiful work! I couldn't pick just 10 either ! Love your work! Happy New Year! I love your creative work! I love the diagonals on he loves. Great inspiration today from your top 12!! Beautiful work - fab colours. Love them all and so hard to choose but I love the Rain layout. So bold and bright but very clean. I'm definitely going to be watching for your class. Love your style. I love Happy, because I never scrap about myself and it is a great inspiration to do something for me! I love them all but Rain is my favorite...thanks for the chances to win! "He Loves" is probably my favorite layout just because I love this kind of documentation. I wish I had done more of this with my boys. I love your style and how it varies from page to page but still reflects you! Wonderful projects! I think that Celebrate Home mini the best, but really it's all so pretty! Hope 2016 is also a great year for me. Happy New Year! I love your bright, fun scrappy style. Beautiful projects, love all the scrapbook layouts! Oooh such awesome layouts Becki! I think my favorite is the Cousins layout. I love what you did with the Elmers paint pens. Awesome projects. #5 the mini album is my favorite. Amazing job. I know you have to be so happy to look back at all you created. You do a wonderful job. Awesome Top 12! I love the fun Christmas Tree hide & seek layout! Fun pics! Thanks for the chance at your extra prizes too! Wow - you do awesome work- thanks for sharing!! I Love your projects, but to choose just one, I love "cousins". I love the words, the layout, and the colors. Thanks for sharing. Happy New Year! Wonderful projects. Great use of color combos. Thank you so much. Love your style! These are all so great! I love them all but RAIN is really drawing me in! Beautiful stuff!!! I really love the "Nana & Me" page! I love the rain layout, the colors look great together! I like 11 and 12. Thanks for the chance at extra prizes here. Love those preschool besties. Great work Becki. Great layouts, I like the 10th one the best! They are all beautiful. My favorite is rain because I simply adore the colors you used. Totally plan to do a "Nana and Me" layout in the future. All are very beautiful. My favorite is Celebrate coming home, when you used Fuse tool. It is awesome!!! It is so hard to pick just one! I adore your layouts---love your style! I love 'My Crazies' layout--that title is so catchy! (and I might just have scrapped-lifted it) and your Happy layout--I want to do this! Fabulous pages! My fav is the one all about you- Happy. Wonderful projects my favorite ones are #2 and #9. Thanks for the chance to win those great prizes. Nana and Me. She reminds me of my Mom. It's really hard to pick because I love them all!! I think let it rain is my favorite though! Becky, your blog and projects are some of my ultimate favs. Even though I don't do traditional scrapbooking, I just love your style and the details and stories. I'd have to say my fav is the Nana & Me layout. I saw this one earlier in the year and loved it so much! So happy to hop along with you! Such cute projects. I am loving all the "Happy" layout. All of these layouts are super cute but my fav is "Cousins". I love words and that background paper is super cute! "Rain" is my favorite. I like the stripes and how they make the page pop. The color scheme is really neat. My Crazies. I love that! nana and me is my favorite project although it was very difficult to choose because I love all of your pieces! Love the way you have laid your projects out - so creative! Fantastic pages Becki - makes me want to go scrap right now. Great to be hopping with you!